It was a perfect night for field hockey on the opening day of the 2013 fall season. 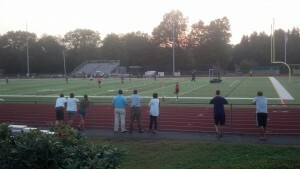 Guilford traveled to Cheshire for a field hockey match Tuesday night, September 10, on what was the first date of competition for the 2013 fall sports season. In and of itself, this was far from extraordinary. When the season opened that night there were approximately 80 competitions taking place, and the scene in Cheshire was surely similar to the ones taking place across the state. The scene, on an absolutely perfect night for games, struck home as the essence of high school sports in that there was nothing out of the ordinary. Looking around the field on that day, the dominant attraction was the game, which matched two teams that hold high hopes entering the season. The easy story was the match featured squads that were one step away from claiming championships a year ago, as Cheshire fell in the final of the Class L tournament to Darien, and Guilford was thwarted by Wilton in the Class M championship. In fact the two teams have historically been two of the top programs in the state throughout their history with a combined 24 finals appearances and 10 championships between them. The two programs even met in a championship match in 2001, with Cheshire prevailing in overtime by a 2-1 score. Yet on this night, thoughts of championships and state tournaments were far in the distance. On this night it was about the excitement of the preseason being over, and having the chance to get out on the field in real competition. It was about learning what your team can do, and what it still needs to work on. It was learning your teammates, and how they respond to adverse situations, or how they deal with success. Likewise the coaches are learning about their teams, and seeing how the work of the preseason is coming to fruition on the field. Guilford defenders line up to defend a penalty corner early in the second half in its season opener against Cheshire. The excitement, stories and unique perspectives are not limited to the players on the field or the coaching staffs. For everyone in attendance, the game on this day, in this place, has a different meaning. There are the parents, hanging on every swing of the stick and living and dying with every shot towards goal, and appreciating this chance to watch their child compete. The junior varsity players, having completed their match, now sit on the sidelines cheering, likely thinking about what they will do when their varsity opportunity is presented. A different perspective is provided by a former varsity field hockey player (who happens to be my wife) lamenting the fact that her career took place before the proliferation of turf fields that have dramatically changed the skill and speed of the game. The ticket taker who makes sure to push the one-night-only opportunity to buy a season ticket plan that will save me money in the long run brings her own energy to the proceedings. Even the student workers, whether the ones running lines to retrieve the ball, or the ones in the press box doing the PA announcing, are part of the fabric of the game, and are essential in their own way, and lead me to ponder what has inspired them to take the time to be out here this evening. Together, these people all fit together in a beautiful tapestry that is high school sports. And yes, it is sappy and sentimental to talk about a lone field hockey game in this fashion. Yet in this case, I went to the match hoping to find a story interesting enough to tell. What stood out is that it could have been any game, any sport, anywhere in the state and the scene would have been basically the same. A group of students competing and giving it their all, learning little lessons, pushing themselves to be better, while a number of interested parties look on in various roles. Countless games take place every day and night for months, and this could have been any single one of them. That is what makes the experience special, is that each game is special in its own way to each person taking part. Who knows what memory a player, or coach, or fan will take from the game. The fact is, every night there are a myriad number of opportunities to create those lessons, and it is a special thing to have an opportunity to create those moments. Every single time. 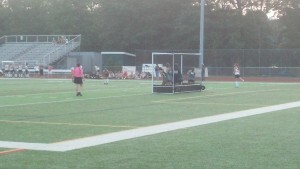 Cheshire won the match on this night by a score of 2-1. In many, many ways, the result is absolutely irrelevant.